Kampu was a shaman who died and became a frog. Before dying, he said: "I'll help cure diseases." There's a time of year, when the monkeys start to gain weight, the kampu starts to sing. The people in the village know that this is a good time to hunt. They carry out a ritual to catch the kampu, who likes to stay in the top of a tree. You have to take a flashlight. He sings his song and then we can find him. We know the songs of all the frogs. Before catching the kampu, you have to talk to him. Only the shaman can catch him. When we find the kampu we tap him on the head with a toothpick. The "milk" comes out. Scrape his back and legs with the toothpick. It is more or less like milk from a rubber tree. Then we let it dry. It becomes a powder. Then we make three holes in the person's arm and put the powder on them. It's good to take hot corn caiçuma (a fermented drink); we take from three to five liters. It fills up the person's stomach, helps with the side effects. We don't give it to children...only after twelve years old. When the hunter turns enpanameado ("with panema"3) he cannot hunt or fish. He can't find anything. He shoots and misses. So he needs an "injection" of kampu. Also, when a person is ill, with dirt inside the belly, we give him an injection. Kampu prepares the spirit of the hunter. He becomes strong, renewed. He is happy with the hunt and catches tapir. Everything in the woods has an owner. There are the Yuxin spirits and the enchanted Yuxibo. You must respect them in order not to be attacked by them. You have to ask permission--you cannot just go taking what you want from nature. An Indian friend agreed to give me the treatment. He would give me at least three applications, every thirty days. I'll now recount the first. It was noon. Before starting, he told me to drink a liter of papaya juice with water. He made five "points" (small burns) on my arm with a smoldering vine. The "injection" (application of the secretion to the wounds) hurt a little. But I did not care, and was talking. Inside, I felt a little courageous. For about twenty to thirty minutes I felt a very strong effect. My heart was pounding arrhythmically. My head was throbbing and I felt heavy. Sweat ran down my forehead. For about twenty to thirty minutes I felt a very strong effect. My heart was pounding arrhythmically. My head was throbbing and I felt heavy. Sweat ran down my forehead. I felt nausea and a slight shiver throughout my body, as if "threads" ran through me. These threads felt as if "they" had volition of their own. It was unlike any other feeling I had ever had before. And I've experimented with quite a lot. My friend had explained to me earlier: "Kampu warms our blood and our head." Groggy, I tried to vomit or defecate, but nothing came out. "Okay then..." I thought. Then I lay down. Within me there was a festival of uncontrolled feelings, bad and new. After a while, my friend told me to sit down and wet the burns on my arm with water. I asked: "Why are you doing this?" "For you to throw up," he replied. Not long after, I vomited. It was a single, sudden stream, and it almost escaped all over me. I vomited through the mouth and nose at the same time. I had never before vomited through my nose. Yuck! Very strange. There was a horrible taste in my mouth and nose, which lasted until the next day. Then I lay down again, with my hand on my head. My friend came near and sang a song. He stood over me, and made some movements with his hands. I didn't see them as my eyes were closed. They made a little nice breeze on me. It felt like he knew what he was doing, that there was some kind of knowledge present--and this comforted me a little. I went to the bathroom again. I looked in the mirror. I was so ugly. Ave Maria. My eyes red, sinking inwards. Or perhaps it was my cheeks and mouth that were all swollen. Bia the Frog. The effect was going away, and things were calming down. I asked my friend about the experience, and he told me: "You threw up, and that is good. But you vomited little; you did not arrive to the yellow color yet. Your spirit is still dirty; you need to clean it more." The first written description of kambo was likely one made by Constantin Tastevin, a French missionary, in 1925. In the 1950s, kambo began attracting the interest of medicine. In the 1980s, anthropological studies were conducted that described its use by indigenous peoples in southwest Amazonia. During this decade, researchers discovered that the secretion of the frog is rich in peptides--short proteins possessing biochemical properties with great potential for therapeutic use. In the late 1980s, the first kambo-related patent applications were made. In Brazil, in the latter part of the twentieth century, rubber tappers learned about kambo's use from the Indians in the Amazon. They began to apply it to white people, in the towns of Acre. Francisco Gomes, or Shiban, from Cruzeiro do Sul, who had lived some years with the Katukina, is regarded as one of the pioneers of the use of kambo outside of local Amazonian contexts. Soon the practice spread, and rubber tappers from the north and middle-class whites began to use kambo in the large cities. There were reports that people were selling the substance to others. Some were accused of being charlatans. Others traveled to Acre, studying or making alliances with rubber tappers or Indians. In 2004, a Katukina group from Cruzeiro do Norte contacted Minister Marina Silva to denounce the misuse of kambo. They demanded measures against the pirate use of kambo by city dwellers, and were also concerned about their intellectual property rights in the case of drugs derived from the substance. It should be remembered that many years may sometimes pass between the time when a patent application is filed and the point when a pharmaceutical agent is brought to market. On April 29, 2004, the Agência Nacional de Vigilância Sanitária [National Sanitary Surveillance Agency--ANVISA] prohibited any advertising of the medicinal and therapeutic benefits of kambo, and shut down a site that had been advertising kambo treatments. Minister Marina Silva decided to treat this as a model case. For this purpose, she appointed a working group of the Ministry of Environment to take action. The group, whose first and last meeting was held in 2005, included representatives of indigenous peoples, anthropologists, specialists in Indian affairs, herpetologists (biologists who study amphibians and reptiles), molecular biologists, and medical doctors. On March 21-22, 2005, a technical seminar was held in Brasilia. According to one of the members of the group, anthropologist Manuela Carneiro da Cunha of the University of Chicago, "the Indians are worried about intellectual property rights. There are already about 70 patents on the uses of substances isolated from the secretion and synthesized. 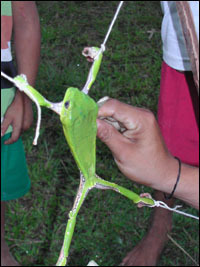 Although the frog can be found all over western Amazonia, it is used for the 'frog injection' by groups whose language belongs to the Pano group and some of their immediate neighbors. The request came from the Katukina, but others will be included among possible beneficiaries. The project should cover, initially, the Katukina, the Kaxinawá, and possibly the Yawanawá." At the meeting, another issue discussed was that of "medical approval". Doctors insisted that, although indigenous groups use the substance as a healing practice with apparent benefit, this does not replace the need for conventional tests--pre-clinical (animal testing) and clinical (human tests). This process can take from ten to twelve years. Dr. Glacus de Souza Brito, from the Department of Immunology, Faculty of Medicine, University of São Paulo, also a member of the government study group, said, "We know very little about it. There are only empirical and anthropological reports, but we urgently need to study the effects of the substance on the immune system." 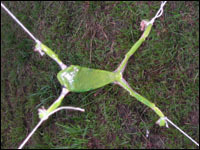 Other possible outcomes discussed were the creation of management systems for the frog to prevent its extinction (given the high demand for kambo at the time), and to promote the training of Indians specialized in its application. After participating in the technical seminar organized by the government in Brasilia, Sherê, a teacher from the Katukina village of Samaúma in Juruá (Acre) arrived in São Paulo together with Ni-í, a cacique suplente (deputy chief) and health worker from the Katukina village of Campinas. Both belong to the Katukina Association of Campinas (AKAC). During scheduled stops in São Paulo, Rio de Janeiro, and Belo Horizonte, they applied the "frog vaccine" to those interested. In São Paulo, they attended patients in the Casa do Sol clinic, located in the district of Pompéia and run by Sonia Maria Valença Menezes, a flower essence practitioner, acupuncturist, and member of the Santo Daime religious movement. Menezes first came into contact with kambo in 1999, through Francisco Gomes and his family. She then travelled to Acre a number of times and eventually designated herself the AKAC representative in São Paulo. On April 6, 2005, the Fênix Clinic for Alternative Medicine and Therapies in the district of Bela Vista, São Paulo, hosted a meeting with Ni-í and Menezes. The clinic is run by psychiatrist Paulo Urban, who works with his own psycho-medical approach, "Psychotherapy of Enchantment", a practice that "brings together knowledge of Jungian psychology, alchemy, hyperventilation, and shamanic experiences." 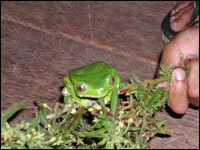 In November and December 2004, Urban received three applications of the "frog poison". He said the experience gave him a "deep learning", and was encouraged to discover more about the subject. An audience member asked why Ni-í was in São Paulo. The deputy chief answered: "In the city there are many people that need help, who are ill, with many problems, depression... So we are spreading our knowledge. We have known of this medicine for a long time, but now the white man has become interested in it. We can't keep it to ourselves, or stop its spread... there's no way. And we are the ones who know how to use it in the right way." A third person asked what types of disease kambo can cure. Menezes replied that it "is a powerful natural energizer, and it increases the efficiency of the immune system. I was infertile, but treatment with kambo allowed me to get pregnant." She referred to the substance as a "divine being", and said that "healing comes according to the merit of each person", which shows a clear influence of ideas from the Santo Daime. In March 2005, Ni-í and Menezes gave a lecture at the First Meeting of Brazilian Shamanism, organized by the Lua Cheia Santo Daime religious group at the Pax Universal Fraternity Center in São Paulo. The meeting brought together an eclectic group of Indians, urban shamans, anthropologists, and esoteric practitioners of various healing arts. The audience seemed curious, but no one signed up for the treatment with the skin secretion of the green frog. According to anthropologist Edilene Coffaci de Lima, a professor at the Federal University of Paraná, who has connected with the Katukina people since the 1990s, "The marketing of the substance by whites generates dissatisfaction among the Katukina; however, from the standpoint of the state, it would be difficult to establish a regulation of the 'traditional use of kambo' or a kind of 'market reserve' for application only by Indians, as some would like." She believes there is a "big difference" between "just using the frog secretion, as Indians and rubber tappers have long been doing in the Upper Juruá, and marketing the secretion or applying the kambo, as has been done recently." As of 2005, the frog venom had been incorporated above all into the circuits of holistic therapy clinics and new urban religious groups. Professor Lima believes that in the specific case of the Katukina, a process of the "shamanization of kambo is taking place." She explains: "In villages, kampo is mainly used for hunting and to combat laziness and is applied by anyone, provided you have moral attributes recognized as positive by the group. But in the big cities, there is a tendency to think of kambo as if it depended on secret knowledge and initiations (typical of a shaman), and the vaccine is being used as a drug capable of combating all evils." In fact, it appears that the substance is being touted as a kind of antidote against "white [person] panema". It is not hard to imagine that in the future there will be many variations of the use of kambo. Maybe even a church dedicated to "Saint Kambo of the Green Light"? I still can't tell whether I benefitted from kambo. In the first few days following my initial experience, nothing in particular caught my attention. But about five days later I began to feel something of the frog inside me. I dreamed twice of a green frog. It was the frog and me, me and the frog. Might I have been influenced because I had been reading about it? The second application included seven "points" (burns). This time I was badly treated, and began to find the frog somewhat mean. Either way, the scar that is on my arm--a series of small holes aligned horizontally, which stung until they healed-- still gives me a pleasant feeling of strength. AQUINO, Terri & Marcelo P. IGLESIAS (1994). Kaxinawá do rio Jordão. História, território, economia e desenvolvimento sustentado. Rio Branco, Pro-Indian Commission. CARNEIRO DA CUNHA, Manuela (2005). "Des grenouilles et des hommes". Télérama hors série, Les Indiens du Brésil. Paris, March 2005, pp. 80-83. LIMA, Edilene Coffaci de (2000). A pedra da serpente. Saber e classificação da natureza entre os katukina. Ph. D. thesis, University of São Paulo. LIMA, Edilene Coffaci de (2002). "Habitantes: os Katukina". In: CARNEIRO DA CUNHA, Manuela & Mauro ALMEIDA (Eds). Enciclopédia da Floresta. O alto Juruá: práticas e conhecimentos das populações. São Paulo, Companhia das Letras. pp. 169-176. MONTAGNER MELATTI, Delvair (1985). O mundo dos espíritos: estudo etnográfico dos ritos de cura Marubo. Ph. D. thesis, University of Brasília. PEREZ GIL, Laura (1999). Pelos caminhos de Yuve: conhecimento, cura e poder no xamanismo yawanawa. M.A. dissertation, Federal University of Santa Catarina. SOUZA, Moisés Barbosa et alii. (2002). "Anfíbios". In: CARNEIRO DA CUNHA, Manuela & Mauro ALMEIDA (Eds). Enciclopédia da Floresta. O alto Juruá: práticas e conhecimentos das populações. São Paulo, Companhia das Letras. pp. 601-614. Research Associate at the Institute of Medical Psychology, Heidelberg University (bialabate.net). The term "panema" refers to bad luck in hunting. The frog and the medicine bear the same name, and there are variants of the name among the different indigenous groups. Phyllomedusa bicolor Photos by Edilene Coffaci de Lima. Katukina village of Campinas, Campinas River Indigenous Land, Acre. January 2005.
v 1.0 - 2005 - Labate - Original Portuguese text. v 2.0 - Aug 22, 2012 - Labate - Translated for Erowid.org, with Notes and minor updates.